Step into Synplant's garden of sound. Synplant is a new virtual instrument from Sonic Charge, and the chances are that you won't have seen anything quite like it before. Designed by Magnus Lidström, the man responsible for Reason's Malström synth, this doesn't have an interface that's laden with dials and knobs. Instead, you can create sounds organically by 'growing' them. This design ethic is reflected in Synplant's interface - you have to plant seeds that then blossom into patches. As you adjust your plant's branches, the sound changes. The idea is that you spend less time thinking about the nuts and bolts of synthesis and more time using your ears. "Synplant is a serious instrument, and one of the most original we've seen for some time." Synplant is so simple that it can be used by pretty much anyone, but those who want to go deeper can "crack open their sound seeds" and explore more detailed editing options. This is by no means a gimmicky plug-in - it's a serious instrument, and one of the most original we've seen for some time. 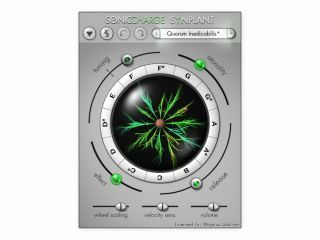 Synplant can be downloaded now from the Sonic Charge website - it costs $89 (plus VAT) and supports the VST and AU plug-in formats on Mac and PC.